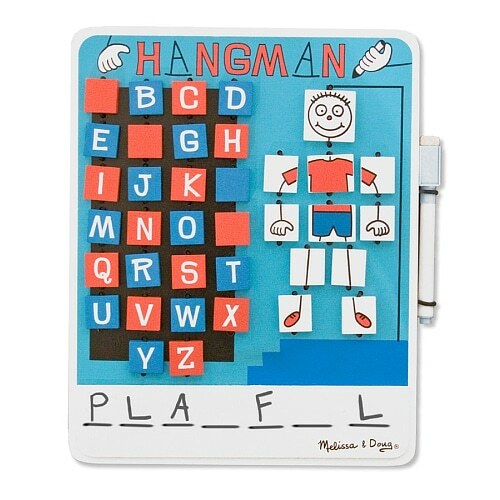 Flip to Win Hangman from Melissa & Doug is a classic word game that is perfectly designed for the travelling family. It has been on dozens of long distance trips with us as a family over the years and has now been handed down to nieces and nephews. The quality if fantastic. This wooden version of Hangman comes with every letter of the alphabet and every part of the hangman made up of wooden tiles that are attached to the board on elastics, so nothing can fall off and get lost. This is such a win when travelling or when taking a game to places like doctors’ waiting rooms or restaurants. Children also love the sound of the wooden tiles as they get flipped over because they make a satisfying ‘click’ sound. This is usually a two-player game although it can be adapted for more than two players. Player A thinks up a word and maps it out on the whiteboard with the whiteboard marker by drawing lines representing the position of each letter in the word. Player B takes a guess, calling out a letter to see if it forms part of the word. This gives them clues as to what the word may be. As they call out a letter they flip it over over on the board so that it cannot be used again. If the letter is correct because it appears in the word, Player A writes the letter in the appropriate space on the whiteboard. If the letter is incorrect then a piece of the hangman is turned over. The goal is to work out the word before the hangman is complete. Player B may guess the word at any stage of the game. If they are wrong, another piece of the hangman gets turned over. Break up words into their constituent letters and group letters to create meaningful words. This skill is known as analysis and synthesis. The Melissa & Doug Flip to Win Hangman was reviewed by Nikki Bush for Toy Talk. It was also selected for Nikki’s highly recommended short list of games and toys in 2012 and continues to be a regular recommendation when parents are looking for a word game travel toy.